Concentrated Photovoltaics (CPV) is increasingly been recognized as the technology which holds the greatest promise in meeting the energy challenges facing the world. A concentrating photovoltaic (CPV) system converts light energy into electrical energy in the same way that conventional photovoltaic technology does. The difference in the technologies lies in the addition of an optical system that focuses a large area of sunlight onto each cell. 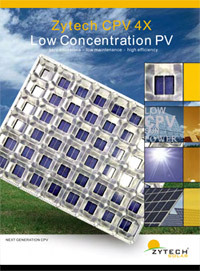 Concentrating photovoltaics has been an established science since the 1970s, but is only now reaching commercial viability. It is the newest technology to enter the solar Sector. High concentration, where the ratio lies above 150X, but is usually less than 1000X. 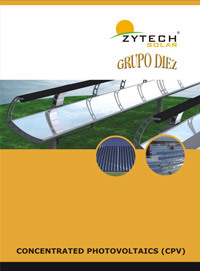 Scalable to a range of sizes.Zytech Solar has focused its own technology on the development of low concentration technology. With an approximate concentration of 2.25X, it produces 1.8 to 2 times more power than a regular PV installation. Low concentration technology takes into consideration new legal requirements. With an approximate concentration of 2.25X, it produces 1.8 to 2 times more power than a regular PV installation, just by adding low cost side mirrors. 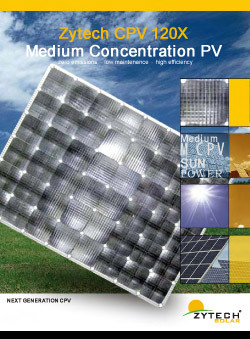 The PV module adapts to higher temperature work with few changes. Cells have a specific design for work in 5X conditions. Accords to IEC 62108 requirements. Control modules temperature with PT100 resistance.